Have you ever paid your hard-earned cash for a package of chip clips ? I remember paying nearly $10 for a pack of plastic clips at a home kitchen-supplies party. Well, how does FREE sound? A lot better to my ears. Let me show a quick and easy way to do it. Look in your closet for those plastic hangers that typically hold pants, skirts or shorts on them. You know, the hangers with the clips on either end. Using a serrated knife , cut through the plastic of the hanger so that the clip can be separated from the body of the hanger. I can usually cut part of the way through the plastic and then snap the remaining part of plastic off cleanly. Repeating the process on both sides, you should end up with two clips and the interior body of the hanger (which you can either discard or use for some other re-purpose). 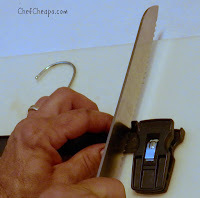 I am sure if you are a really crafty person you can easily use a hot glue gun and attach a couple of round magnets to one side of each of these clips so you can hang them on the refrigerator when not in use. Keep your eyes open in your local super center or department store parking lot because for some reason this type of hanger seems to get abandoned there often. 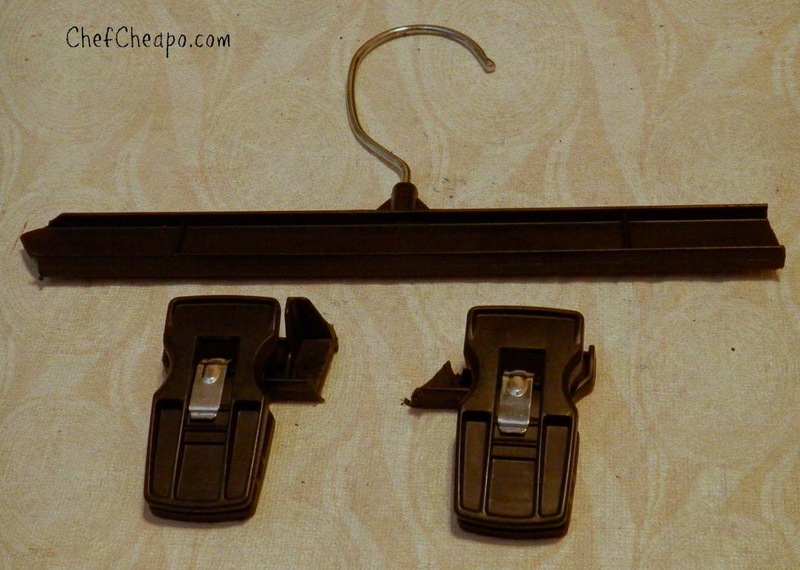 Or the next time you are at a clothing store simply ask the clerk if you can have some extra hangers. I am sure they would not really care if they gave them away or put them in the back room.